Review: I really enjoyed The Husband's Secret and thought this would be another fast paced 'I can't put this down!' read. Wow, I was mistaken. Alice wakes up at the gym (the gym-wait a second, she hates working out) and thinks she's 29, happily married and pregnant with her first child. Surprise! She's actually 39, has 3 kids and is in the middle of a nasty divorce. She tries to navigate what happened in the last decade while trying to convince her husband to give the relationship another chance. She also realizes her relationship with her sister is strained and tries to figure out what is going on. Moriarty was absolutely spot on regarding married life and how small things can compound and result feelings of resentment. 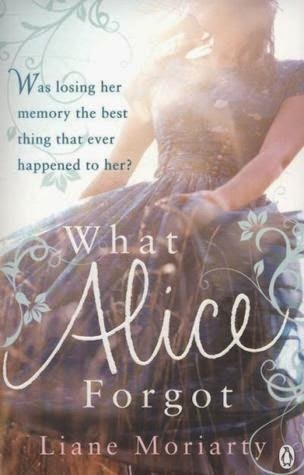 I think the premise of this book is good but the main issue for me was Alice. I didn't find her likable or interesting at all. Her 29 year old self was so clueless and immature, she read more like a 21 year old. The dialogue with her husband (when they were both 29) was ridiculous. The ending was not a surprise and I feel like at least 150 pages could have been edited out. Overall-interesting idea and good premise but I was bored by the main character.